S. curtilobum (curtilobum meaning “short nightshade,” which might refer to the leaves or the whole plant) is perhaps better included among the cultivated species than the wild, but as species that has one quarter wild genetics, the dividing line isn’t entirely clear. This species is treated more like a wild species in breeding programs. This species is cultivated primarily in the highest elevations of the Andes, from northern Peru to southern Bolivia, where S. tuberosum ssp. andigenum will not survive due to frost. None of the accounts of this species that I have found indicate that it has ever been found in Colombia, but the USDA lists three accessions from Colombia, which is a puzzle. Plants grow about 12 to 16 inches tall, although some take a more wild-type rosette form. Tubers most commonly have blue skin and white flesh. They do not have the kind of diversity of form found in either parent species and are typically round to oval with shallow eyes. Flowers usually blue. S. curtilobum is high in glycoalkaloids and is only consumed after processing into chuno. The origin of S. curtilobum is believed to be as a hybrid between tetraploid S. tuberosum ssp. andigenum and S. juzepczukii, making its genetic composition three-quarters S. tuberosum ssp. andigenum and one quarter S. acaule. The tuberosum parent is tetraploid and 4EBN, while S. juzepczukii is triploid and 2EBN. To cross successfully, S. juzepczukii must have provided an unreduced (2n) gamete, giving the combination of a 2x tuberosum gamete and a 3x S. juzepczukii gamete for a 5x (pentaploid) progeny. Although it has an odd ploidy, S. curtilobum is self-compatible and is able to cross with other 4EBN species. These crosses typically produce near-tetraploid aneuploids; that is, tetraploids with some extra chromosomes. If these aneuploids are backcrossed to the tetraploid parent, they tend to lose the extra chromosomes. S. curtilobum has not been synthesized by crossing the putative parent species. This might be because it is hard to get the required 2n gamete from S. juzepczukii or it could be an indication that the hypothesized parents are not correct. 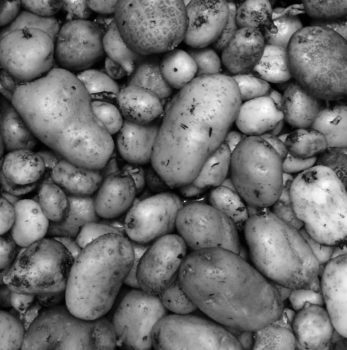 Vega (1995) found that this species is a little more frost tolerant than domesticated potato. 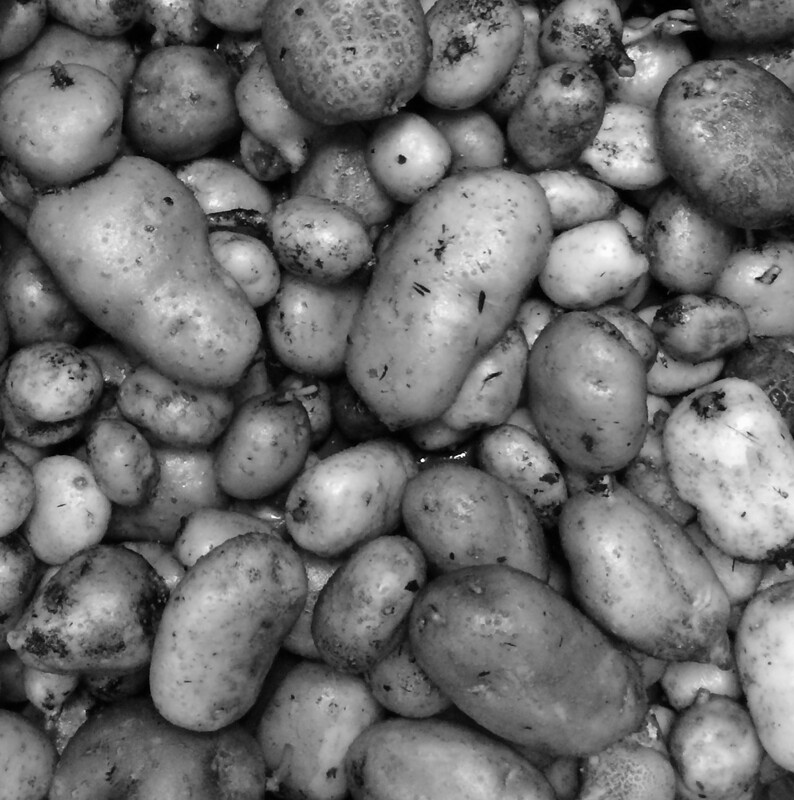 This species is generally used to make chuño or similarly processed potatoes, typically an indication of high glycoalkaloids. Osman (1978) found TGA levels ranging from 3.8 to 29.0 mg / 100 g for this species, levels that are not particularly high. This species is self compatible and will produce viable seed, but the seed does not produce true S. curtilobum. Instead, first generation seeds usually produce aneuploids between tetraploid and pentaploid. Subsquent self-pollinated generations converge toward tetraploidy. True S. curtilobum can only be propagated clonally. I think it is kind of surprising that there hasn’t been more breeding done with S. curtilobum as a tetraploid. After a few generations of selfing or crossing between varieties, they stabilize at the tetraploid level. Pentaploid S. curtilobum has 3 copies of the andigenum genome and 2 copies of the acaule genome. During the process of tetraploid stabilization, it will lose one copy of the andigenum genome, so the tetraploid is 50% andigenum and 50% acaule. There ought to be plenty of interesting traits to explore in that mix.